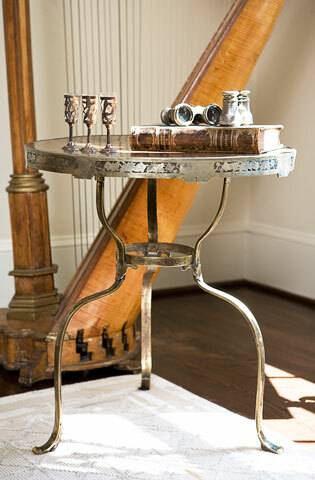 Here are a few simple vignettes that we are loving and we hope will offer a little inspiration. 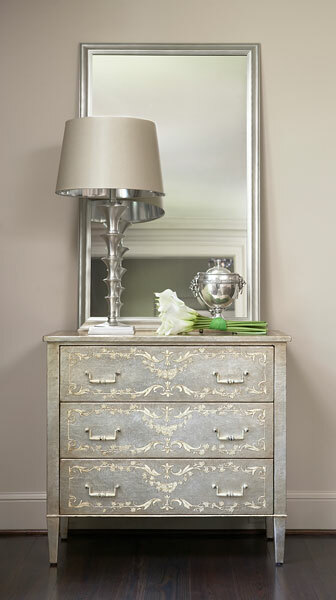 This ornate chest alone is a big statement piece in this bedroom, but the simple addition of a lamp, leaning mirror, flowers and vintage accessory further command our attention. Creating a welcoming entry for guests is important in a home. 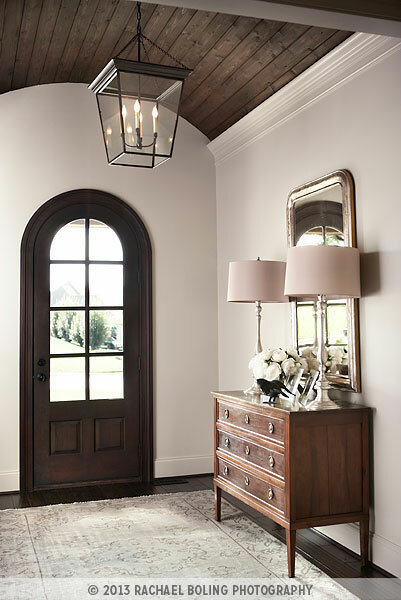 This entryway chest is flanked with by an antique Louis Philippe mirror, lamps, fresh flowers and picture frames that create a cozy entrance sure to make guests feel welcome. Vignettes aren't strictly reserved for tabletops alone though. Wall art, like these silver metal leaves, can be incorporated into a vignette. Placing them low enough to the furniture and adding a few tabletop accessories that complement the art piece creates an area with dimension and height, drawing your eye initially to the furniture and then up the wall. 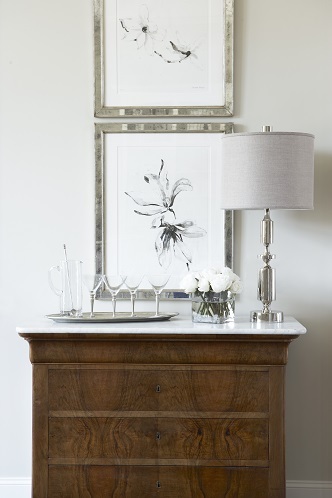 Sometimes utilizing a piece to create a vignette simply for style and not function can add so much character to a space. This gold antique side table is full of antique treasures and mementos that tell a beautiful story and add warmth to this corner of the room. Whether or not the piece is actually used as a functional side table or not, it does add significant character to the overall space. Large tiered candlesticks on this antique buffet draw your eye to the corner of this master bedroom. 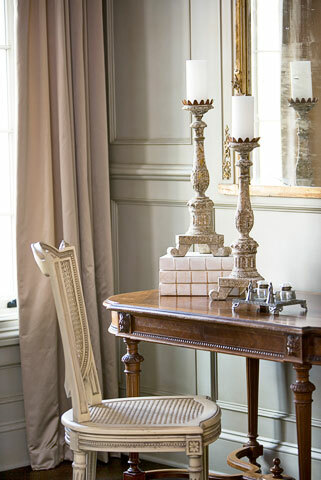 The stately height of the candlesticks also draws your eye up to the built-in antique mirror. The additional accessories in this vignette offer personal touches for the residents of this home. This final vignette is a wonderful example of how you can display some of your go-to items you might need on a daily or weekly basis. This gorgeous barware is just a reach away but is beautifully displayed among other accessories like wall art, a lamp and flowers to create both a stylish and functional space. Do you have any vignettes on display in your home? If you like the look of this simple and functional vignette on display, learn how you can get the look yourself in our designers' corner of our online boutique. If you aren't sure how to go about styling your accessories into a beautiful vignette, download these five tips from our design team to master the art of styling.